Dynamic physical processes of rivers can cause channels in some areas to move laterally, or "migrate," over time. The area within which a river channel is likely to move over a period of time is often referred to as the channel migration zone. The migration of river channels across their floodplains and the occasional erosion of terrace banks are natural processes. 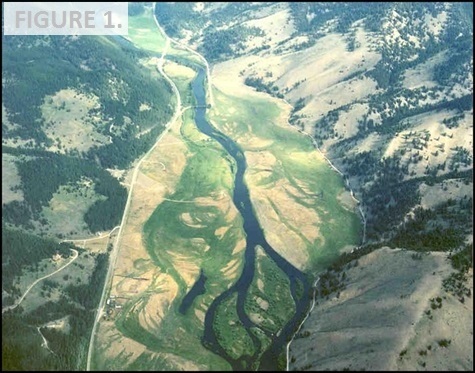 Figure 1 is an aerial view of the Big Hole River showing channel migration locations (former channels) as darker green meander scrolls in the floodplain (photographer unknown). Channel migration can occur as a persistent process of lateral bank erosion and sediment deposition; the natural meander patterns of stream channels are the result of this process of sediment cycling. Channel migration also can occur abruptly, as the river carves a new channel at a new location (“avulses”). Avulsions may occur within the river’s meanderbelt as bendway cutoffs, or may occur on the floodplain beyond the main axis of the river corridor. Floodplain avulsions can be unpredictable, occurring during floods when the existing channel becomes less efficient than the avulsion path. This can be due to a topographic advantage of the avulsion path (steeper gradient), or due to more random events such as debris accumulations, ice jamming, or sediment infilling of the main channel. Floodplain avulsions are rare events relative to the processes of progressive bank migration and meander cutoff. Interference with the natural process of channel migration often has unintended consequences for human users of the river and its valley. When natural patterns of channel movement are altered through bank armoring, rivers can respond by rapidly eroding other areas, requiring the costly expansion of those armoring projects. As bank armor expands, channel migration and floodplain turnover processes become progressively arrested. This can result in adverse impacts to biological systems due to the degradation of in-stream aquatic habitat and reduced rates and extents of riparian forest regeneration. The failure to recognize the dynamic nature of rivers often leads to development strategies that result in costly engineering projects, infrastructure damage, and threats to human safety. By accommodating a reasonable zone of channel movement, we can effectively sustain the ecology of our rivers while reducing risks to human health and safety. Figure 2. Interactive map of Montana showing areas with channel migration studies. Channel Migration Zone (CMZ) mapping is based on the understanding that rivers are dynamic and move laterally across their floodplains through time. As such, over a given time period, rivers occupy a corridor area whose width is dependent on rates of channel shift. The processes associated with channel movement include lateral channel migration and more rapid channel avulsion. The fundamental concept of CMZ mapping is to identify the corridor area that a stream channel or series of stream channels can be expected to occupy over a given timeframe. A 100-year CMZ is a typical timeframe used as a corridor defining a century of anticipated channel movement. This timeframe allows for riparian forest maturation within the dynamic river corridor and provides a practical compromise compared to the entire river valley bottom. Channel migration zone mapping serves as a science-based tool to help the public, landowners, and decision makers develop an understanding of river dynamics, along with the inherent risks and benefits associated with those processes. Historic Migration Zone (HMZ) – the area of historic channel occupation, usually defined by the available photographic record. This can be thought of as the cumulative footprint of the channel as seen in available historic imagery. Erosion Hazard Area (EHA) – the area outside the HMZ susceptible to channel occupation due to channel migration or mass wasting. This is the area that, based on historic rates of migration, the river may occupy over the period of the CMZ. Avulsion Hazard Zone (AHZ) – floodplain areas geomorphically susceptible to abrupt channel relocation. These are often swales, historic channels, or bendways that are not captured by the EHA. 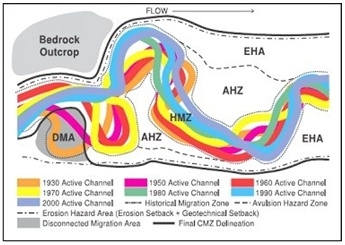 Restricted Migration Area (RMA) – areas of CMZ isolated from the current river channel by constructed bank and floodplain protection features (also known as the Disconnected Migration Area, or DMA). Figure 3. Schematic of the Channel Migration Zone (CMZ). CMZ = HMZ + AHZ + EHA – RMA or DMA. Image from Washington Dept of Ecology. This general definition allows for some flexibility in terms of both component definitions and the component inclusion in the CMZ. For example, one approach identified by the State of Washington is to use meander belt width and bendway amplitude to define the EHA, rather than measured erosion rates. This approach would be appropriate in channelized reaches where natural migration is largely inhibited. In addition, whether or not the RMA is included in the CMZ requires a decision as to whether bank armor should be considered effectively managed, stable, and permanent. Some project stakeholders have been inclined to highlight the RMA, but not to exclude it from the CMZ as Rapp and Abbe (2003) propose. This is why the areas behind armor are called “restricted” migration areas rather than “disconnected” migration areas. As described above, CMZ mapping can be carried out with a variety of supporting datasets or analytical methodologies to define historic channel locations and anticipated rates of future movement. Depending on the risks being considered, stakeholders may opt to select historic migration rate statistics that capture long-term average rates of movement (e.g. mean historic rate). Alternatively, anticipated changes in land use or hydrology may prompt stakeholders to consider using lower probability rates of migration (e.g. maximum historic rate). Any anticipated change in sediment or flow inputs from the watershed above the project can affect the mapping strategy; for example, if a dam is slated for removal above the project, this should be considered in the determination of the anticipated rates of future erosion. Depending on the stream type, some mapping efforts define the historic belt width and do not directly apply historic migration rate measurements. The scales of CMZ mapping projects can vary from a site scale to a reach scale. All of these potential variations in mapping strategies indicate that it is critical that CMZ map users thoroughly familiarize themselves with supporting documentation that defines the criteria for CMZ development. It is also important that those involved with CMZ mapping work closely with stakeholders to ensure that the mapping criteria are clearly articulated, understood, and agreed upon. The introduction to a recent Washington State Department of Ecology publication (Legg, N.T. and Olson, P. August 2014, Publication 14-06-028) summarizes some of the major ecological considerations and human development concerns in channel migration zones. Channel migration is the process by which stream channels move and shape floodplains through time (Wolman and Leopold, 1957). By virtue of its ability to recruit wood to channels, structure floodplain landforms, and create new ground for vegetation to establish, channel migration is the primary physical process in valley bottoms that creates habitat for aquatic organisms and terrestrial species (e.g. Ward and Stanford, 1995). In addition to ecological benefits, channel migration commonly threatens infrastructure like roads, homes, levees, and waste water treatment plants through its ability to erode large areas of floodplains and adjacent areas. Human development in channel migration zones (CMZs) often results in significant economic impacts associated with property loss and costs of erosion protection measures. Efforts to limit channel migration and protect development are not only expensive, but can adversely impact fluvial ecosystems, worsen downstream flooding, and induce damage to adjacent or across channel property. Further, channel migration into developed areas can introduce waste and contaminants into channels which impact water quality far downstream (Walling et al., 2003).